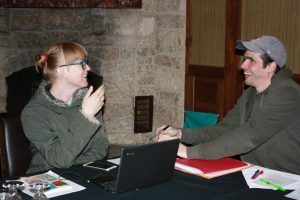 In March 2019, the Philosophy Department held its first annual Philosophy Workshop at Riding Mountain National Park. The workshop brought together six researchers for a day of presenting and sharing feedback on research work in progress. Stay tuned for details about next year’s workshop! Fabien-Denis Cayer explains a subtle point about Plato’s lesser-known dialogue, Clitophon. Dr. Hanemaayer and Dr. Inkpen discuss the lighter side of philosophy of medicine. 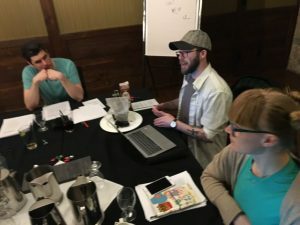 In Fall 2018, the Philosophy Department formed the Philosophy Reading Group. The group meets once every two weeks during term time. Members discuss papers in a wide range of topics in philosophy! This year we read papers in philosophy of biology, philosophy of medicine, epistemology, philosophy of perception, and social theory. Paper topic selection is determined by the interests of the members of the group. The reading group will be up and running again in Fall 2019! Please email Dr. Cameron Boult at boultc@brandonu.ca if you’d like more details!